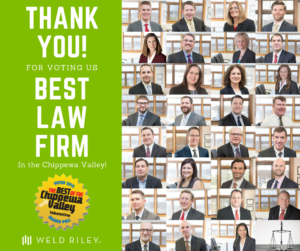 Weld Riley, S.C is proud to have been voted Best Law Firm in Volume One’s Best of the Chippewa Valley Reader Poll for the second year in a row! Thank you to everyone who voted for us and supported us. We couldn’t have done it without you!